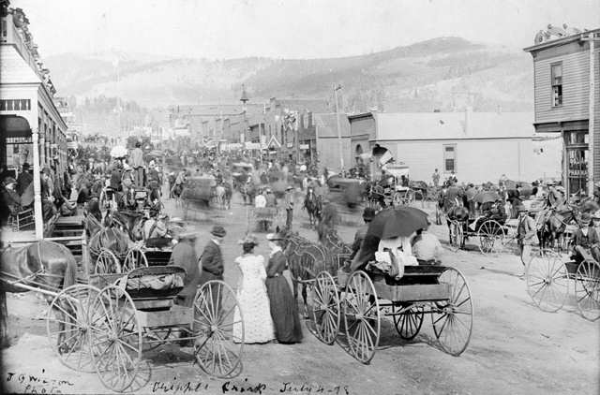 (now Cripple Creek, Colorado),starting a rush that caught the attention of the world. in the high countrybehind Pikes Peak. and labor unions, it isn’t so hard to believe that there may be ghosts who continue to wander this historic town. 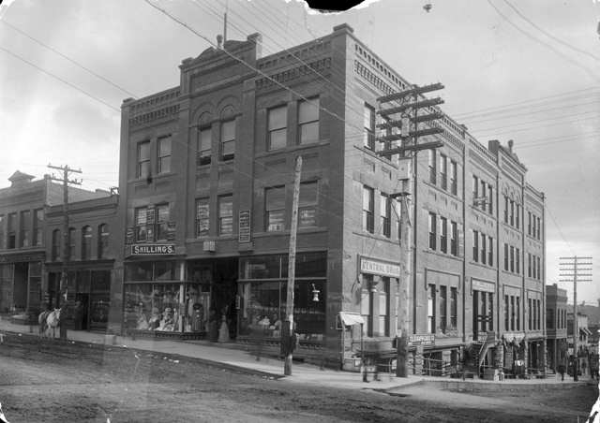 The Fairley Brothers and Lampman building at 300 East Bennett now houses the Colorado Grande Casino and Maggie’s Restaurant. on the top two floors of the building, the sound of her high heeled boots are often heard echoing in the halls. believed to be the result of a ghost pulling energy from the air in an attempt to manifest in some way. in with us and it stayed on the entire time - at least half an hour. CORPS website:www.paranormalcolorado.com, along with any additional evidence that may have been discovered during the analysis. posted at their web site within the next few weeks. 1901-1992, and was eventually transformed into a museum in the fall of 2007.
the museum, and frankly this reporter got chills. convicted criminals across counties or state lines. museum and later this month a haunted house, yes a haunted house. For more information, call the Jail Museum at 719-689-6556 or the District Museum at 719-689-2634. The Last Dollar Inn has been sold to new owners -- and at last check, they do NOT conduct the ghost tours. ...Guests can still stay at the haunted Last Dollar Inn B&B--which is continuing to operate as a bed and breakfast and open to the public. For those with a love of gambling and ghost tales, the Last Dollar Inn has a room with a view. Built in 1898, it is said to be one of the most haunted houses in town, according to its owner, Rick Wood. seen any objects moving on their own. 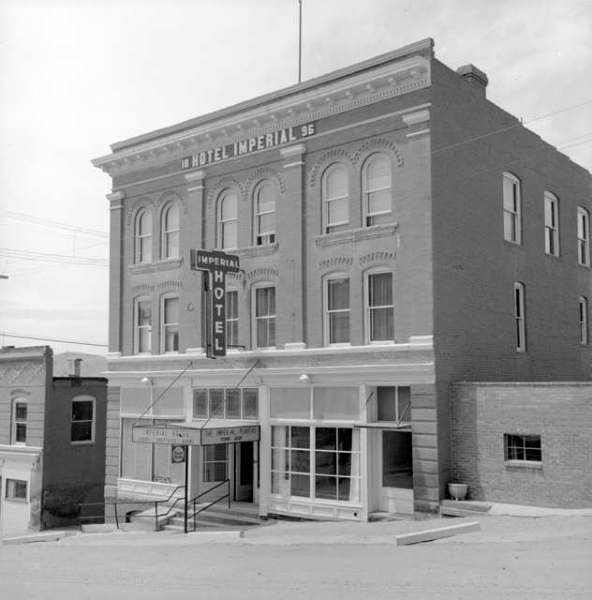 The location has proven to be a gold mine of opportunity for the inn because many guests stumble across it while gambling. "We get a lot of walk-ups, and the hotels refer people to us when they're booked, so it's great for us," Wood said. He said the rebuilding took longer than planned because he and his wife, Janice, wanted to maintain the historical value of the house. "We wanted to make sure we kept as much of the original structure as possible," he said. rooms, big store rooms, and I have some commercial equipment in the kitchen. It makes things run a little smoother," Wood said. Even though it took a lot of work to get it where they wanted it, Wood said he couldn't be happier. "When we walked in, we knew right away it was the perfect location. We're real happy with what we've got," he said. ~ and George, the permanent resident! ***** (As featured in Jeff Belanger's book, "The World's Most Haunted Places," p. 61-67). Author Kathi Mac Iver- Ghost lectures! 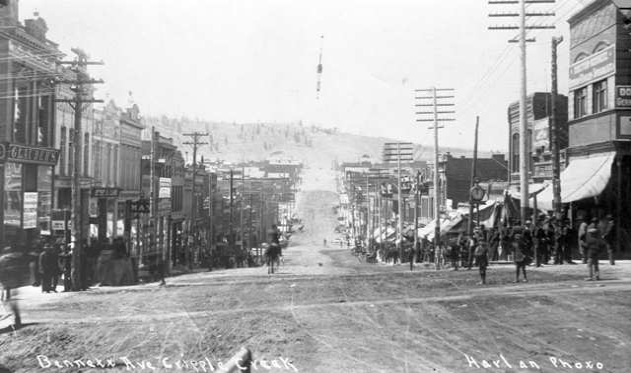 the Mining District, Mount Pisgah: A Complete Guide to Cripple Creek's Historic Burial Grounds, A Pictorial View of Mt. 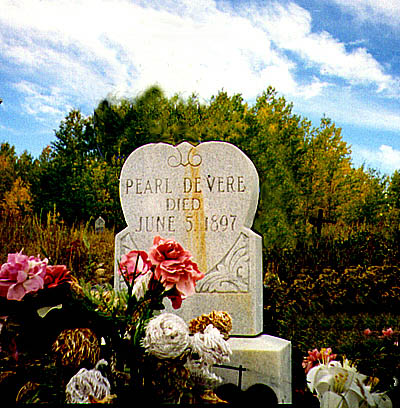 - Hosts excellent lectures on the hauntings and the sacred burial grounds of Cripple Creek! Now available to: libraries, schools, historic societies and civic organizations. 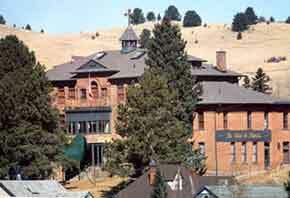 If you would like to tour the historic Mount Pisgah Cemetery, pick up a walking tour at the Cripple Creek Chamber of Commerce. ****Also, the Gold Camp Victorian Society hosts an annual cemetery tour of Mount Pisgah Cemetery. event was, and continues to be well received by visitors. 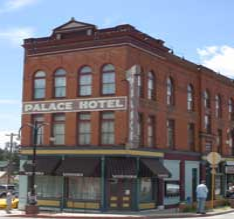 *** Important note: The Palace Hotel (Casino) is currently CLOSED. Womack's Casino has purchased the property but haven't made any structural changes to it yet. night when he was shampooing the dining-room carpet at 3 a.m. that he encountered her. It was then he felt "a presence, someone else in the room, for about five minutes." He shut off the machine and looked toward the door of the lobby. "And there she was, a lady walking by ... in one of those old-fashioned white night gowns, with ruffles on the sleeves and at the neck. Her hair was down, just straight." front door. There was no sound. When Lays got the courage to enter the lobby, it was empty. The encounter left him so shaken, he says he talked to the ghost out loud, while he finished shampooing the carpet. "I said, 'I don't care if you want to show yourself once in a while, but could you not scare me like that again?'" 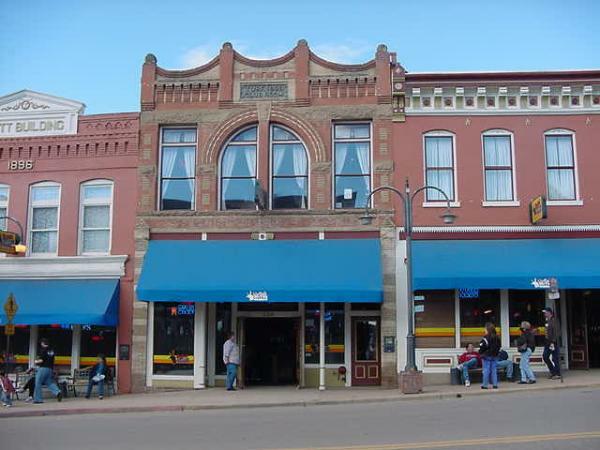 A woman from Cripple Creek told him she once saw the same figure in the window of room 3. Other guests in the hotel have reported sighting the same elusive woman. "I know they see her, because they supply details I haven't told anyone," Lay says. eccentric woman who lived in Cripple Creek for a while. 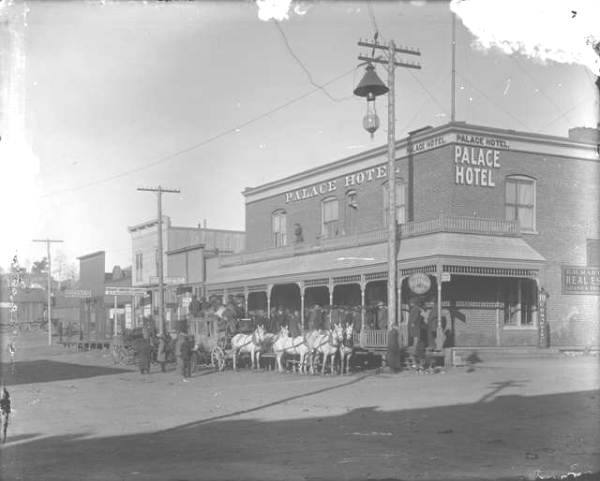 Rather, it's probably Mary Hedges, who ran the hotel from 1916 to 1918, he says he was told by a local historian. wood-burning stoves and an added attraction: His name is Ed. He's a ghost. Ed opens kitchen drawers and shuts them. He hammers on the roof and plinks glasses together as if making an Irish toast. instantly, it would knock on the front door and I'd be running back and forth. I'd say: `Ed, stop it!' And it would stop." Sylvain and her husband, Russell Sylvain, moved out of the haunted house when gambling came to Cripple Creek. They're asking $129,000 for the home at 126 Aspen St., which was built as a log cabin sometime in the late 1890s. Realtors Jay and Enid Angello are advertising the property as a "Documented Haunted House." 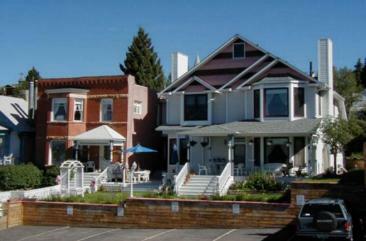 The home has been featured in the book "Ghosts of Cripple Creek." Apparently, the ghost was there long before Sylvain moved into the gray house with white trim in 1974.
creaking because it was old. hear them - heavy ones - stomping over the wooden dining room floor. but that part has never been confirmed in any history book. house the Sylvains own. But he may have left something behind near the house. Sylvain found a silver fork engraved with the letters "O'B" while digging for bottles in her yard in the late 1970s. Ed. My husband's doing that here (in Paonia). I tell him, `You can't blame it on Ed.' "
He was there for a second, then disappeared. The family that lived in the house before the Sylvains had two young boys who saw a man dressed in a long overcoat and a derby hat. she describes as a `nonbeliever,' felt the same sensation. something Sylvain could not see, and their fur would stand up and they'd become extremely agitated. But no one was ever as agitated with "Ed" as the couple who came from Virginia to visit the Sylvains. His wife, who had been asleep next to him, swore it wasn't her. That's when Sylvain told the ex-Marine about "Ed," the friendly, mischievous ghost. Next morning, the ex-Marine and his wife packed their bags and drove back to Virginia. The ghost is named MAGGIE. Security guards have reported seeing Maggie and a gentleman friend playing a slot machine after hours. MAGGIE HAS BEEN TAPED BY THE SECURITY CAMERAS. Mysteriously, the tapes have "vanished," just as Maggie does when the security guards run down to the casino floor. The tape was sent to Unsolved Mysteries- but then the show went off the air. Does the Colorado Gaming Commission possibly have a copy of this tape.....? occupies the building's first floor. second-floor hall when she heard the sound of high heels walking on the third floor. She started upstairs to investigate. her head and she wore a white shirtwaist, a long cotton skirt and high-heeled boots. Maggie greeted Katherine Hartz through mental telepathy; Hartz answered the same way. Maggie, adding that she plays a concertina, and sings in a beautiful Irish-accented sorpano voice. "She's been around dozens of times; in fact, she's never gone away. She's always around here, even if you can't see her." a beautiful human being. There isn't any story. She's just a nice person. There are a lot of nice entities in our midst." Haunted by a young girl named Lilly. She draws on the walls at the top of the steps. A female employee saw Lilly sitting on a stairstep. She said that her name was Lilly. went to notify a security guard, they returned moments later to find the little girl gone. the mother asked her what she was doing up there, the little girl replied that she was just playing with Lilly. and sounds that offer no apparent rational explanation. seems that at least two friendly, but mischievous spirits, call the hotel home. number, the St. Nicholas’ spirits seem to be a friendly and playful, if elusive group. reported on the hotel a number of times. Hotel St. Nicholas is on the left in two blocks.